In a sharp departure from the University’s traditional course offerings and its prized core curriculum, a new RSO is putting students in classes designed and taught by other students, learning material that puts an alternative spin on well-trodden academic fields. The RSO is called Off-Topic, and the classes it has offered this quarter—such as one studying the work of rising graphic novelist Alison Bechdel and another on the history of the city’s transit system—bear the mark of the students who proposed them. “Off-Topic allows students to approach areas of interests collaboratively and to learn from each other,” said third-year Tyler Lutz, one of the RSO’s founders. The idea for originated between Lutz and second-year Sabrina Bremner when Bremner asked Lutz to teach her German in return for lessons in Italian. “So we struck a deal. It was informal and mutually beneficial,” Bremner said. While this would be the inception of Off-Topic, the model came from DeCal, a peer-to-peer learning program started in the 1960s at the University of California, Berkeley, which Lutz attended before transferring here. Lutz, who taught a DeCal course and took several of them, wanted to apply its basic principles at the U of C. Along with Bremner, he envisioned Off-Topic as an open, low-stress environment for learning. They spent the winter planning the logistics and applied for funding through SG before classes began this quarter. 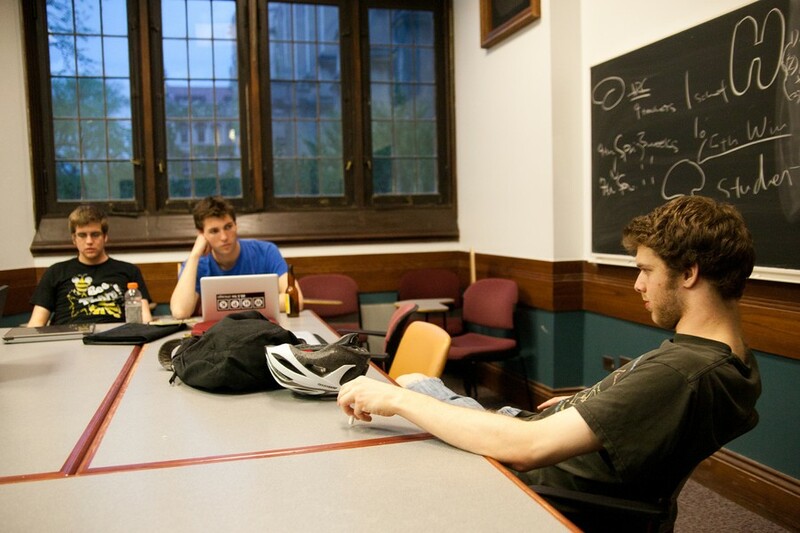 Any undergraduate, graduate student, or faculty member may design a class, and far fewer conditions are required in order to teach courses than in DeCal, where a faculty adviser and an assigned reading list are musts. Currently, Off-Topic sponsors four courses: “Worldbuilding”; “Consciousness: Theoretical and empirical approaches”; “Are You My Mother? Reading Alison Bechdel”; and “History of Chicago transit.” Four other courses have been proposed. “By not offering credit, this allows students much more flexibility and fewer constraints in developing courses,” Lutz said. Additionally, there are no requirements on meeting time, the frequency of meetings, or on the course structure itself. Already, Lutz and Bremner have been surprised by the immediate interest and the variety of the courses proposed. Lutz hopes to expand course offerings to instruct entire RSOs and use Off-Topic as a vehicle for alternative education on campus. “As people become more exposed to Off-Topic, they’ll think about possibilities for new courses and course development,” Bremner said. The process for forming a class is fairly simple. Anyone can submit a course idea on the Off-Topic website, and after providing a course description and a proposed curriculum, the course may begin when enough students register. With roughly 40 students enrolled so far, Off-Topic seems to have tapped into a demand for peer-to-peer teaching on campus, Bremner said. First-year Phoebe Salzman-Cohen teaches “Worldbuilding” when she isn’t taking Off-Topic classes herself. She describes the class as a seminar and discussion course covering the gamut of creative writing, mythology, geography, psychology, politics, linguistics, and philosophy. “If there’s something you’re interested in...make a class about it,” she said.